Generate electricity, collect fuel and manage exotic flights from the couch. Game Insight's Airport City HD is unique because it's both an airport and city builder in one; the fact that it's free-to-play boosts the appeal even further. This means you need to constantly micromanage both facets of the game, as each side is dependent upon the other. Yes, it's a lot to take in, but with this Airport City cheats and tips guide, you'll have no trouble sending passengers to exotic destinations while amassing a ton of gold coins along the way. 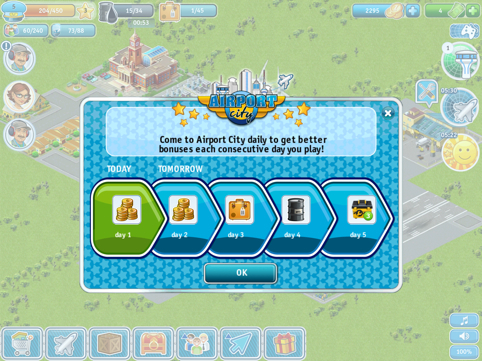 Let's face it, you can only play Airport City for so long until it becomes nearly impossible to progress without putting the game down for hours, or spending actual money to make things happen quicker. If you prefer the latter, consider the following. You can't fly a plane until the flight is sold out. That means you need passengers on hand at all times. Getting these people ready to go involves leaving the airport to erect residential buildings, all of which produce one or more passengers over different lengths of time. On that note, be sure to visit the Shop. From there, select Residential Buildings and purchase what makes the most sense. 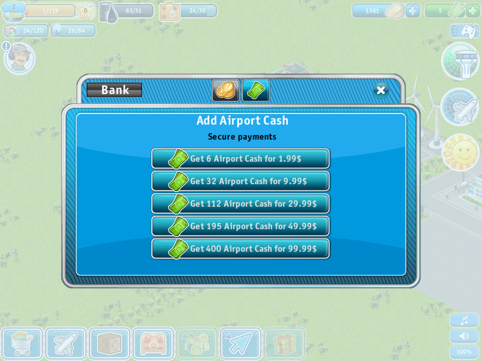 Keep in mind some buildings cost gold, while others require Airport Cash; this is consistent for all buildings in the game. Cottage (40 coins): Yields one passenger every two minutes. Side Wing (180 coins): Yields two passengers every five minutes. Townhouse (Eight Airport Cash): Yields eight passengers every 20 minutes. Mansion (250 coins): Yields 18 passengers every hour. Stone Castle (12 Airport Cash): Yields 36 passengers every hour. Eatery (70 coins): Yields two coins every two minutes. Grocery Store (90 coins): Yields nine coins every 10 minutes. Donuts (eight Airport Cash): Yields 40 coins every hour. Flower Shop (160 coins): Yields 11 coins every 15 minutes. Car Dealership (350 coins): Yields 36 coins every 20 minutes. If you don't feel like waiting for the construction workers to finish building that pharmacy, for example, you can speed up the process by parting with a reasonable amount of gold. Definitely the easiest way to complete certain missions the quickest. 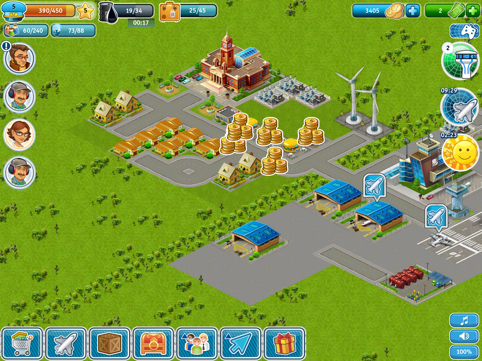 Fuel plays a very important role in Airport City. Not only do you need it to let planes take off, but also incoming planes not associated with your airport. Conserving/producing it is a high priority. If you have a reasonable amount and have also grown tired waiting for planes to return from long trips, go ahead and speed up some of the longer flights, as doing this will immediately send the planes back to the runway. Click the "flights in progress" icon on the right side of the screen, locate the desired plane and have at it. There's nothing wrong with giving your city and airport's moneymaking abilities a boost. Visit the Store, then click Bonuses (smiley face) to get the jump on getting rich quick. Spy Glass (four Airport Cash): Increases the chance of quest item drop (both common and collectible) by 150 percent for six hours. Bottomless Barrel (four Airport Cash): Doubles maximum fuel for eight hours. Matryoshka Doll (four Airport Cash): Doubles maximum amount of passengers for eight hours. See all those virtual characters' heads on the left side of the screen. These people have missions for you to complete, and it is in your best interest to oblige, since doing this results in rewards. Just make sure you follow their instructions carefully, though as you'll soon learn, many of these objectives take little effort to complete. Eventually, you'll run out of room, both in the city and airport. Unfortunately, land isn't free, or cheap, for that matter. In fact, it only gets more expensive the more you buy. On that note, the developers give you the option of spending gold coins or Airport Cash, and since the latter is especially tough to come by, make sure you decide which form of virtual currency you'd most like to part with. 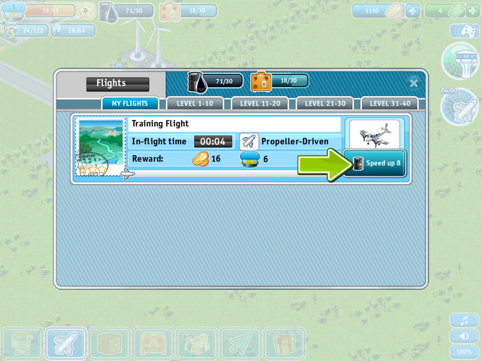 Throughout the course of the game, you'll receive requests from pilots to land at your airport. Letting them do this will cost you a small amount of fuel, but in return, you'll gain gold coins and valuable experience points; you will even complete a couple missions. 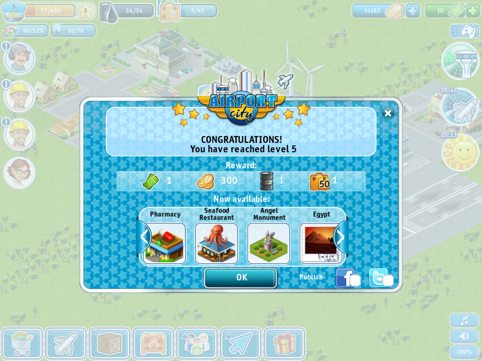 You won't gain access to new buildings, planes and destinations without leveling up. This goes back to completing missions regularly and flying/landing planes, as doing both results in a little XP. While in the Store, click the Resources button to replenish, well, your resources. This runs the proverbial gamut, from fuel to passengers (yes, you can buy passengers), items required for flight and even repair kits, because planes will eventually break and get put out of commission for prolonged periods of time. That is, unless you took care of business first. -View the current inventory by clicking the Warehouse (wooden box) tab along the bottom of the screen. 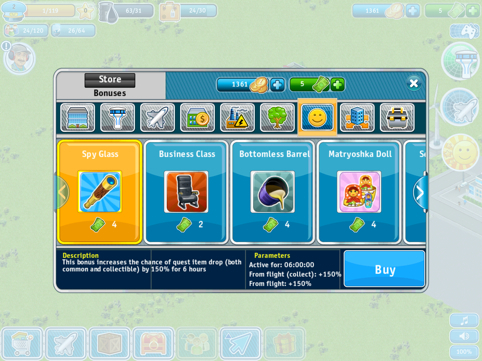 -You can sell buildings and objects by pressing the arrow icon at the bottom of the screen, selecting the piggy bank and then tapping the item you wish to sell. -The bigger your town/airport gets, the more electricity you'll need. Invest in some Power Plants to generate more. Solar Panels and Wind Turbines are more effective producers, though. -Each plane needs its own hangar. -The more runways you have, the more planes can take off and land at any given time. 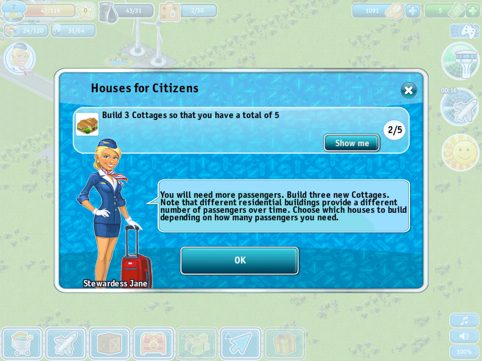 -Upgrading the Town Hall increases a city's population, while upgrading a terminal lets you house more travelers. You can level up to do this free of charge, or spend the required amount of Airport Cash. -Buy Fuel Stations. They'll be able to keep the fuel flowing with minimal effort on your part. -Check back for a daily reward. 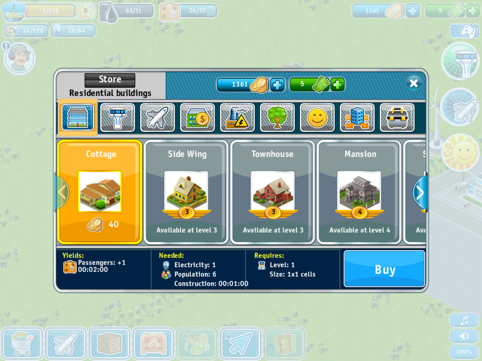 -You can see how long it'll be before a business yields gold/residential building yields passengers by clicking on it. Do you have any helpful tips that we missed? Let us know in the comments section.